Posted March 12, 2018 by Jenna & filed under KidLit Coffee Talk. Good morning, and welcome to KidLit Coffee Talk! 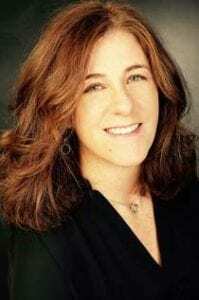 Today, I’m so excited to be chatting with the amazing Karlin Gray. Karlin first caught my attention in 2016 when her debut picture book, Nadia: The Girl Who Couldn’t Sit Still was published. As a former gymnast and huge fan of Nadia Comaneci, I just knew I had to get to know this author! Karlin’s second picture book, An Extraordinary Ordinary Moth is set to be released later this week, and she was gracious enough to answer some of my questions. 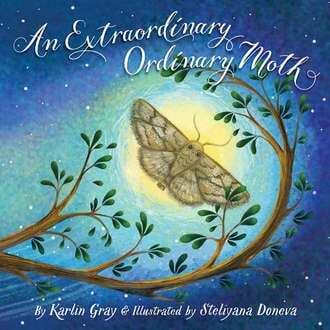 An Extraordinary Ordinary Moth will be published on March 15th, 2018 with Sleeping Bear Press and was illustrated by Steliyana Doneva. Thank you so much for joining me, Karlin! First off, what kind of coffee do you like to drink? French Roast lattes. A few years ago, my husband gave me an espresso/latte maker. Maybe the best gift ever! Everyone benefits when I have two cups—the first while I’m making breakfast and packing my son’s lunch; the second after my son and husband are out the door. I think I need one of those! Tell me a little bit about yourself and your writing journey. I guess my writing journey started in college where I majored in English/Creative Writing and then continued through my career in book publishing and as a freelance copywriter. But it wasn’t until I became a mom that I started to write children’s stories. After working on manuscripts (again and again) at a local writing center, I submitted work to every publisher that reviewed unsolicited manuscripts. I wish I had kept all the rejection letters so I could show kids that big pile next to my first book—Nadia: The Girl Who Couldn’t Sit Still (now in its fourth printing!). Wow, its fourth printing! That’s wonderful! Tell me about your newest book, An Extraordinary Ordinary Moth. When my son was three, he declared, “The moth’s my favorite bug.” My response: “Ew, really?” His sad expression made me take a closer look at his “favorite.” When I did, I learned several things about the little creature (like moths are insects not bugs) and was inspired to write An Extraordinary Ordinary Moth. I love that story. My son is a constant source of inspiration for me, as well. What was the most exciting part of the publication process? What was the hardest? The most exciting part—seeing Steliyana Doneva’s first sketches of all the pages. It’s amazing to see the artist’s vision coming together and my story coming to life. The hardest part is waiting for publication! I’m working with Page Street Kids on my next picture book biography about Serena Williams—Serena: The Littlest Sister—and writing more fiction and nonfiction manuscripts…but only after I’ve savored my two lattes. Ha ha! What is your favorite part of being a published author? When I hear, from a kid or parent, that my book is well-loved in their home. That’s the mic-drop. For sure. What’s one picture book you loved when you were little and a more recent one you love now? Of course I remember Where the Wild Things Are and Goodnight Moon but the book that meant the most to me was Where the Sidewalk Ends by Shel Silverstein. Some of my favorite poems in that book are “Magic,” “The Googies are Coming,” and “Enter this Deserted House.” Today, I love Art by Patrick McDonnell. (I bet Shel Silverstein would like that book, too.) Every time I see Art, it reminds me of being snuggled up with my son for story time. That’s awesome. I still know “Sick” by heart, and every time my children tell me they don’t want to go to school, that poem immediately pops into my head. What are you currently reading? This book is stunning and I love everything about it—the writing, the artwork, the subject matter. Everything except…not fair! You’re the second person in the past week who has mentioned this book to me! I think I need to pick up a copy. What is one thing most people don’t know about you? Thank you so much for chatting with me, Karlin! You have the chance to win a copy of Karlin’s book, An Extraordinary Ordinary Moth. I already have my copy of this book, and I can assure you it’s amazing! You want to add this one to your collection. To enter this giveaway, simply comment on this post. A winner will be chosen at random on Sunday, March 18th. And don’t forget to subscribe to my blog. Good luck! Great interview Jenna! I look forward to reading your new books, Karlin. I too was obsessed with Nadia and the Olympics – I loved your book! Thanks everyone for the great comments and thank you Jenna for the fun interview. Hope everyone gets their coffee fix today! Thanks so much! I look forward to reading this book! Thanks Jenna for the great post. Love your books Karlin! This book sounds so sweet. Our children really do make for great inspiration. Love seeing the world through their eyes. What a fun interview! Thanks for getting this interview out there. It’s always fun to hear about another author’s journey. Congrats on your new book baby!! The cover caught my attention right away because I love butterflies and moths. And then the title…well, who could possibly resist an extraordinary ordinary moth? Plus, the story has a nice message for kids (a message of which I often have to remind my daughter). I look forward to reading it. Great interview. Our inspiration does come from the young ones in our lives. I have hesitated submitting directly to publishers. Good for you! Nadia: The Girl Who Couldn’t Sit Still is a wonderful PB. What a beautiful book baby! Congratulations! Thanks for the fun interview. I enjoy your blog and the behind the scenes of all these new books. I look forward to reading your books, Karlin! Thank you for your kind words, Tracy! Great interview. I loved the Girl Who Couldn’t sit Still. And moths – yes, they are so cool! We have these beautiful maple moths and luna moths and woolly bears who eventually turn into moths. I LOVE your blog, Jenna! The “give aways” are just icing on the cake. Or. . maybe I should say, foam on the latte. What great questions and answers. I enjoyed reading Nadia: The Girl Who Couldn’t Sit Still. I now look forward to learning about moths.